As the restaurant world becomes more and more competitive, entrepreneurs and restaurant owners need to use every tool they have at their disposal. One of the most important things a business owner can do today is start a website. In this modern age, having a web presence is vitally important. And just a simple website might not cut it anymore – people expect businesses, especially restaurants, to have professional websites nowadays. Thankfully, companies like Evolve Digital Creations are making it simple and affordable to make high quality, professional websites. 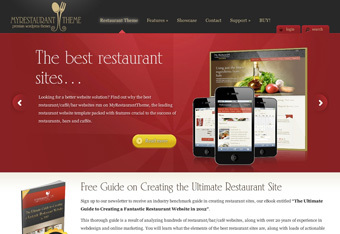 Evolve Digital Creations is a restaurant theme developer for WordPress and the power behind MyRestaurantTheme. They help take most of the legwork out of building a professional website. Their themes are simple to use, and allow the restaurant owner to build a website on his or her own time, instead of hiring a professional (which can cost thousands). In these troubled economic times, every penny you can save really adds up – and you can save a whole lot of pennies by using a WordPress theme! Ever since their founding in 2004, Evolve Digital Creations has been the top restaurant theme developer for WordPress. Unlike many developers, they chose to focus in on one niche – restaurants. Doing this has allowed the team at Evolve to create themes that are perfect for restaurants and cafes. They went above and beyond the standard with their themes at MyRestaurantTheme, themes which allows users to view the menu and even place orders online. These themes also have a built-in coupon system, allowing you to pass on savings to your customers. The MyRestaurantTheme themes created by Evolve Digital Creations are all mobile-friendly, which is great considering many people will be looking up your restaurant on-the-go. And with the purchase of each theme comes a great eBook on the subject of creating a great restaurant website.